Tamilnadu Thali is incomplete without a kootu. Along with the dry curry, you will always find a vegetable kootu in the menu. Kootu is a Tamil word meaning a mix of things, and regarding food, it means a combination of vegetables and lentils. 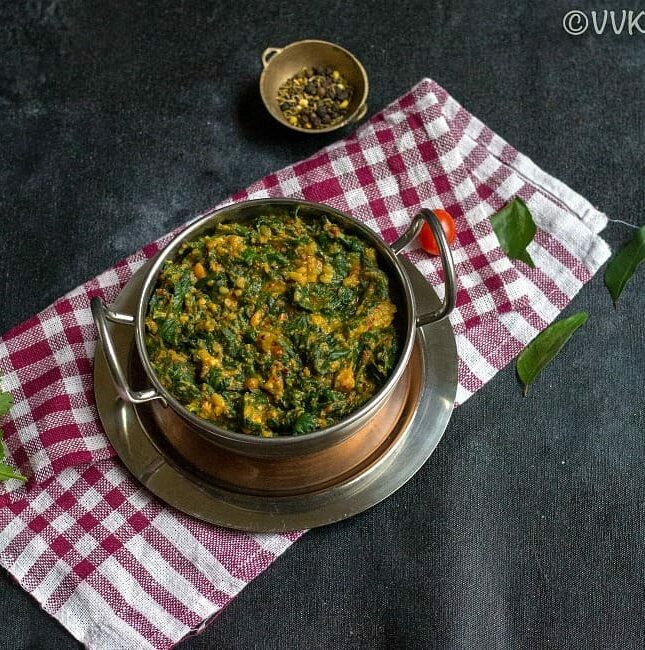 You can make kootu with just one vegetable and lentil or with a mix of vegetables. 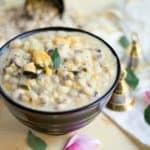 Moong dal or the yellow mung bean and chana dal or the Bengal gram dal are the widely used lentils for the kootu. 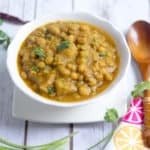 I like to combine chana dal with the melon varieties like winter melon or pumpkin or with snake gourd. For this spinach kootu, I always prefer moong dal. 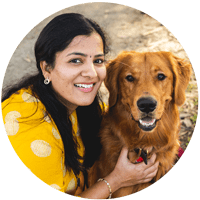 We all love kootu, and vaandu’s favorite is the chow-chow kootu. (Recipe coming soon) Kootu is typically a side dish, but I can have it with just rice and ghee without any sambar or rasam. I introduced all the veggies to vaandu in the form of kootu. I used to make it mild (even now my food is mild) and mix it with rice along with a tsp of ghee and feed him. During busy weekdays, I prefer just kootu and rice. It is easy to make, and it makes a pretty balanced meal. 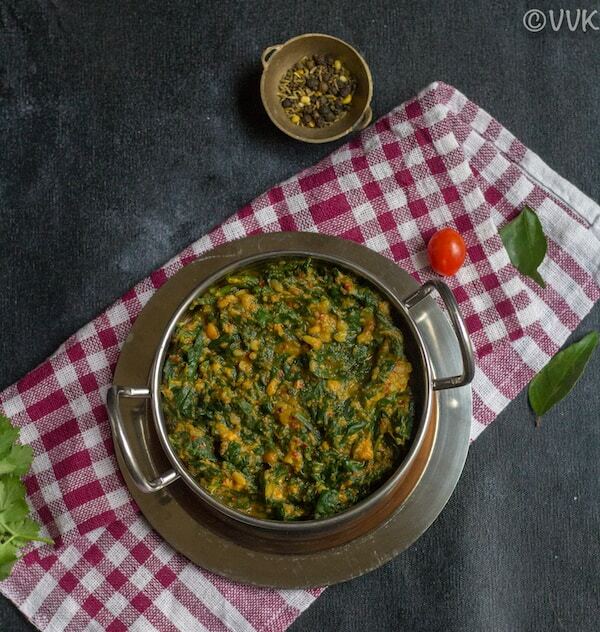 You can not rely only on the kootu for protein as we use only 1/4 cup of moong dal. 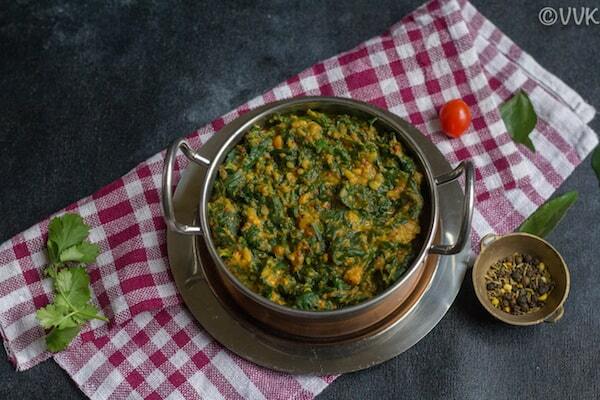 Now without any further ado, here is the spinach kootu recipe. Add some vibrant green color to your meal platter with this delicious kootu. Wash the spinach and drain the water. Chop them roughly. Grind the coconut, cumin seeds, and dried red chilies into a smooth paste by adding 3 tbsps of water. 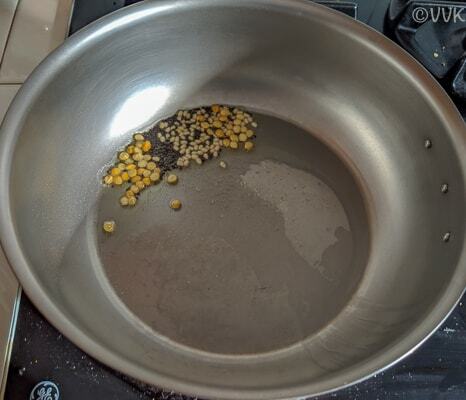 Wash the moong dal and pressure cook it by adding 3/4 cup of water for up to three whistles. If using Instant Pot, then pressure cook it in manual mode for five minutes and release the pressure after five minutes or naturally. Allow the moong dal to cool and mash it roughly. Head the kadai and add the oil. When the oil is hot, add the mustard seeds, urad dal, chana dal, and the hing. 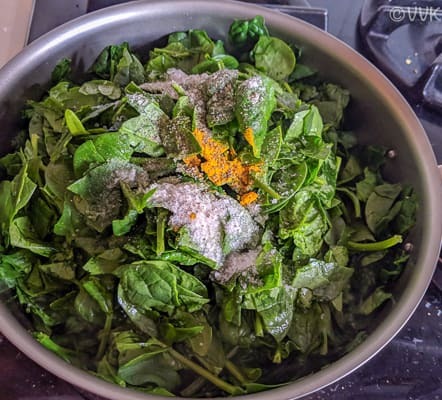 Allow the mustard seeds to splutter and then add the chopped spinach, salt, turmeric powder, and ground pepper. Do not add any water. 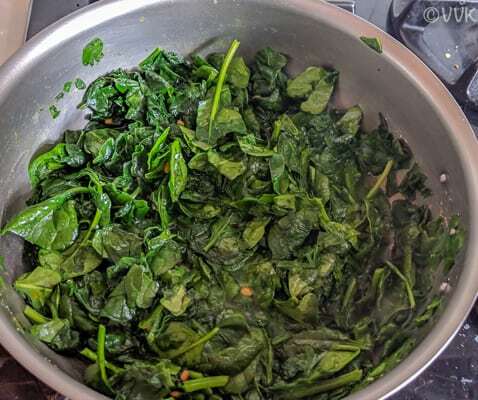 Mix the spinach and allow it to cook for five minutes stirring every two minutes. In less than seven minutes, spinach will wilt and ooze out water. Now add the cooked moong dal and ground coconut paste. Once they splutter add the chopped spinach. Mix them thoroughly and cook for three to four minutes over low-medium heat. If you want thin consistency, then add 1/2 to 3/4 cup of water, and cook it for five more minutes. And that’s it. Spinach kootu is now ready. Serve it hot with rice with a dollop of ghee or serve it as a side along with rice and sambar or rice and rasam. Adjust the water according to your consistency preference. 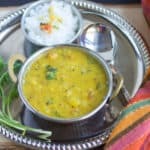 Traditionally moong dal is used in the spinach kootu, but you can try with masoor dal / red lentils or with channa dal / Bengal gram dal. Try not to skip the ground pepper as it acts as an antiseptic. 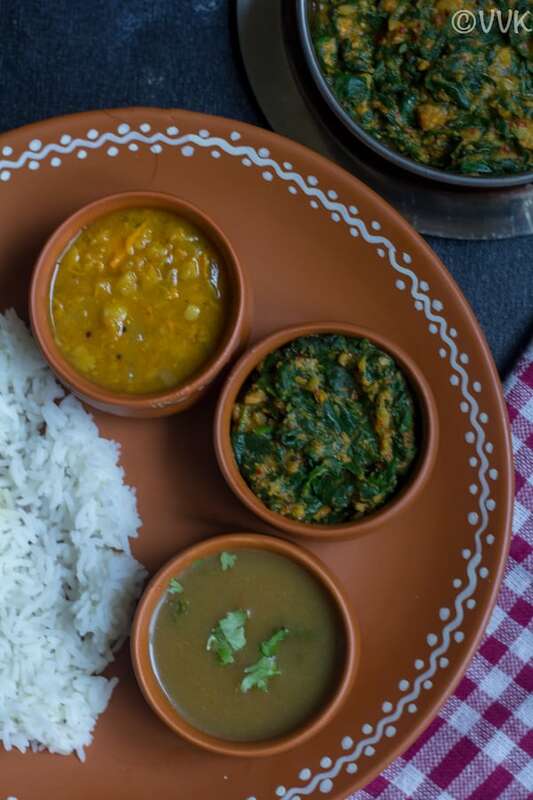 Keerai Kootu - Healthy and delicious moong dal spinach gravy with fresh ground coconut masala - a traditional mealtime gravy from South India without any onion and garlic. And that's it. Spinach kootu is now ready. Serve it hot with rice with a dollop of ghee or serve it as a side along with rice and sambar or rice and rasam. 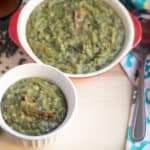 I cook Dal palak in a different way. I like the idea of adding coconut to it.. that must have added a nutty flavour to the dish. Looks tempting!! 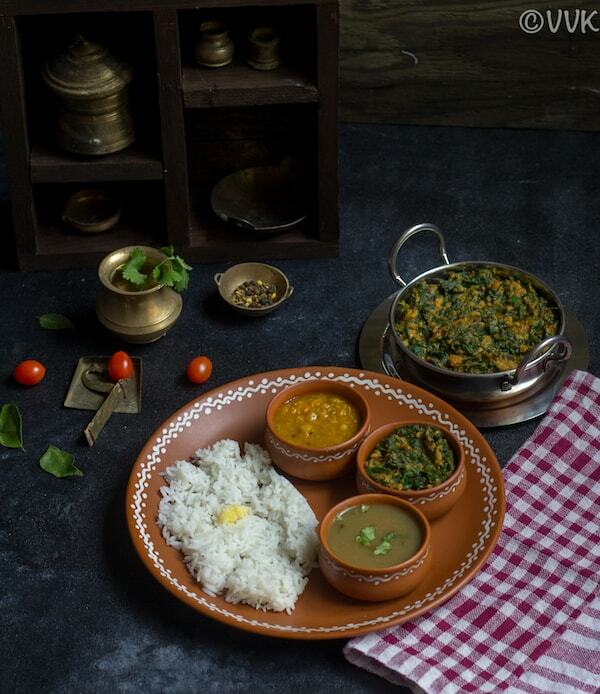 We too love moong dal for most of our kootu Keerai kootu, a simple, yet comforting dish. Thanks :-) Same here. Try to sneak in on all the dishes. It is Veena. Love that combo with rasam. 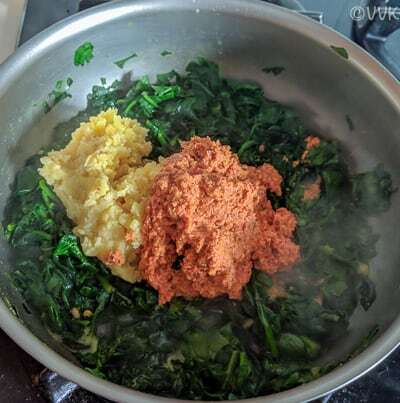 That is a lovely spinach kootu recipe Vidhya. 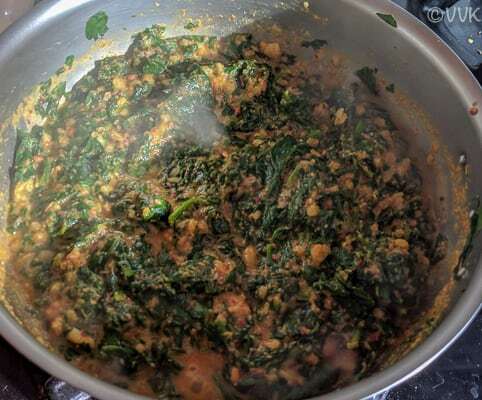 I make chow chow and lauki kootu but never made with spinach. I am definitely going to try this recipe for my family. Pinned!! Love your setup and that thaali looks fabulous. 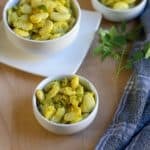 Keerai kootu is the kind of comfort food I want to come home to. :-) Same here. Love these simple and healthy comfort foods. I love this version of koottu. We can add all sorts of greens and make a healthy meal out of it. Comfort food at its best. Love the set up, props and the food there. That is one flavorful and nutritious kootu. The mild kootu is a suitable one for all ages as you mentioned. Am in love with that spice paste went in it, such a flavourful kootu. I can have this kootu with some rice and papads without any fuss. Inviting set up there.